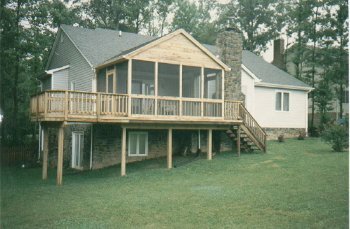 Are you interested in adding a screened porch onto your home? If so, you	have come to the right place. At	Prestige Deck & Fence, we have been providing Fredericksburg deck resurfacing, design, and building	services for more than 25 years. All of our projects are specifically	created with your ideas in mind. Every single porch that we build is customized based on your unique needs,	preferences, and budget. If you have a specific idea in mind for your	home addition, we would be happy to work with you incorporate it into	the designs. Get started by	calling us today at (540) 371-0123 to speak with our friendly, knowledgeable staff!